Incorporates artificial intelligence in enterprise CCaaS platform, plus promises 100% uptime SLA and sets up innovation fund. A year since making its formal move into artificial intelligence, with the introduction of an inside sales-oriented tool, cloud contact center provider Talkdesk today turned our attention to the AI-infused customer experience it envisions for the future. At the center of its latest AI initiative is Talkdesk iQ, a combination of new products and features for the company’s Enterprise Contact Center Platform. 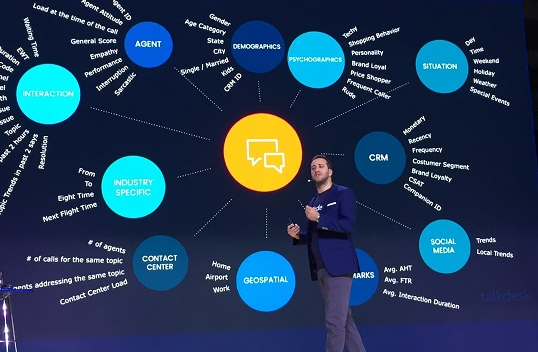 With Talkdesk iQ, companies can draw customer insights and trends out of interactions taking place via the Talkdesk contact center platform, described Tiago Paiva, Talkdesk CEO, in unveiling the AI capabilities today at the company’s annual customer and partner conference, Opentalk 18. Talkdesk iQ can help turn the insights into actions, driving predictive recommendations that should lead to better customer engagements while optimizing agent and contact center efficiency, he added. Talkdesk, plain and simple, is a data company, handling some 1.5 billion interactions annually, Paiva said. And from that data, Talkdesk can help customers make smarter decisions about all things contact center-related. "We don't see AI as a big thing we're going to sell to you and you buy... AI should be everywhere," he said. From here on out, anything that Talkdesk launches will come with intelligence. Talkdesk iQ isn't just a product, Paiva said, "it's a way of thinking." Talkdesk Omnichannel -- Talkdesk iQ gives contact centers the ability to identify, route, and respond to high-profile customer support issues, providing agents quick access to customer profile information they can use to deliver a personalized experience across nearly any channel the customer desires, Talkdesk said in its press release announcing the AI functionalities. Additionally, Talkdesk Omnichannel provides social listening capabilities, a chatbot builder (powered by Talkdesk iQ), and centralized reporting across channels. Talkdesk Analytics -- This reporting and analytics suite features an API-based, customizable dashboard that uses the AI capabilities to cluster and reveal trends, as well as issue alerts; a benchmark tool for comparing peer performance by industry, region, employee, or agent size; and a historical reporting and business analytics tool that delves into data from any channel, device, or point in the customer journey, Talkdesk said. Additionally, Talkdesk iQ can provide agent coaching recommendations via the business analytics tool. Talkdesk Mobile -- With Talkdesk Mobile, sales and service reps can engage with customers from their iOS and Android devices using the Callbar “floating desktop agent interface,” Talkdesk said. Callbar supports inbound and outbound call handling, as well as browser-based functionality such as click to call. Talkdesk iQ comes into play by providing automatic customer mood detection aimed at allowing agents to modify how they handle an interaction according to sentiment. Talkdesk Self-Service SDK -- Customers can now build visual IVR solutions “with clicks, not code,” via a new Android SDK and updated iOS SDKs, Talkdesk said. In addition, they can preserve context captured through mobile interactions, offer callback requests, and provide direct access to knowledge base articles and information using Talkdesk Self-Service SDK. With Talkdesk iQ, they can deliver estimated wait times and present best-fit channel recommendations to streamline self-service. Talkdesk Studio -- In another code-free implementation, this routing flow designer gives customers a visual way to design customer journeys. Talkdesk iQ can recommend optimal flows for streamlined routing, Talkdesk said. 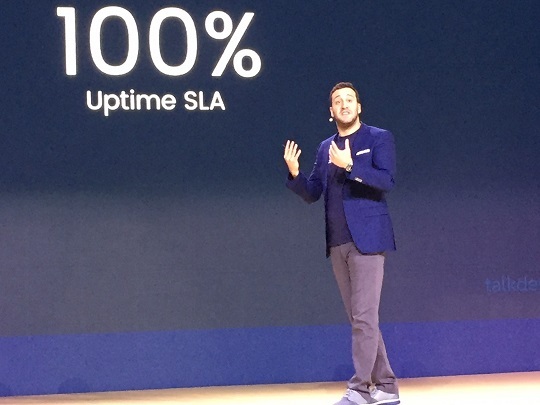 While AI is clearly front and center for Talkdesk (as well as most any contact center/customer experience provider today), it’s not the only thing on the company’s mind, as we also learned during Paiva’s keynote. Exceptional service performance is another, with the company now offering all customers a 100% uptime service-level agreement -- "no shenanigans," Paiva said. Inspiring innovation is a third, with the company announcing that it has carved out a $10 million fund to advance the development of customer experience solutions.